It’s not often that I like a book well enough to track it down and review it again after it’s been republished, but anyone who hangs around here already knows Eden Winters is an autobuy for me. This one’s been hanging fire because of my health issues (sorry about that) but it’s a comfort read, and if I couldn’t write about it, I could at least reread and feel better. It’s even better this time around. 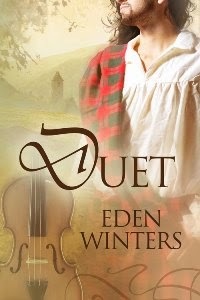 Eden’s grown as a writer and has put a new loving sheen on what was already a great story. Not that I sat down to pick at what’s different this time, that would spoil the fun, but it’s smoother over all, more polished. For those who’ve never read it any other way, it will go down like the smoothest aged Scotch whiskey—a smoky, peaty mouthful. They have a lot to overcome in the contemporary section as well, not just issues of "are we suited for each other?" Really, how do you cope with someone who has a headful of memories and hopes that you are just now finding out about, and you don’t quite believe in him anyway? And how do you keep from throwing a couple centuries’ worth of want at a guy who thinks he’s hallucinating? I am so glad you're back Cryselle! Hugs. Oh, and glad you enjoyed the book too. But just... Sigh. Was worried about you and am so glad you're back. I've missed you. Thank you, Eden. Your stories definitely kept me company these last months. I tell you what, NOBODY works harder at her craft than Eden, and it shows <3 Also, I hope you're looking after yourself and feeling better. Thank you, Ally. And yes, Eden puts in the effort. I've been reading her since her fanfic days. Good stuff even then. Better now.